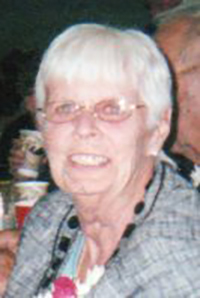 Elsie May (Condon) Waller, age 82, of Cedar Springs, passed away peacefully, Sunday, September 2, 2018 at Mercy Health – St. Mary’s surrounded by her family. Elsie was born July 28, 1936 in Lowell, Michigan the daughter of Boyd and Jeanne (McFarland) Condon. Elsie was a longtime collector of Avon and Precious Moments. She enjoyed her flowers, craft shows, flea markets and time spent with family sitting around (and playing) with the fire at the cabin. She and her husband Bob were able to travel all over the country including Alaska and several trips to Yellowstone National Park. They were able to winter in Florida where they made lifelong friends from all over the country. Elsie was incredibly proud of her grandchildren and great-grandchildren. She enjoyed every minute spent with her family. They loved attending parades and events with the car club, of which they have been members for many years. Elsie was very much loved by her family and many friends and is already missed by all. Surviving are her husband of 63 years, Robert; sons, Gene (Barb) Waller, Gordon (Lauri) Waller; grandchildren, Jessica Waller (RJ), Andrea Edrington, Jackie Slocum (Justin), Amy Hutchinson (Adam); great-grandchildren, Ashley, Brady, Melanie, Brody, Peyton and Evan; sister, Sharon Cramer; sisters-in-law, Ethel Ergang and Helen (Bud) Gambee; special friend, Nancy Norman. She was preceded in death by her parents and a brother, Boyd Condon Jr. The family will greet friends Thursday, September 6 from 2-4 and 6-8 p.m. at the Bliss-Witters & Pike Funeral Home, Cedar Springs where the service will be held Friday 11:00 a.m. Pastor Bill Johnson officiating. Interment East Nelson Cemetery. Memorial contributions may be made to Mercy Health – St. Mary’s Critical Care Unit.